Tribune Publishing’s board gets an A-plus in testing the patience of shareholders. More than 40 percent of investors withheld votes for the eight directors put forward by the Los Angeles Times publisher. That’s virtually unheard of, especially when proxy advisers like ISS favor the candidates. As with other unlikely situations, such as Walt Disney’s investor revolt in 2004, the squeals of jilted minorities can kick directors into action. This should be embarrassing enough for Tribune’s board to force tin-eared Chairman Michael Ferro to listen to Gannett’s overtures. The conglomerate, which also owns the printed organs of record in Baltimore, Hartford and its hometown, Chicago, has twice rebuffed offers – the latest at $15 a share in cash, double what investors had previously thought it was worth – from the largest American newspaper chain. Gannett missed the window to nominate its own set of directors but instead launched a vote-withholding campaign against Tribune’s nominees. 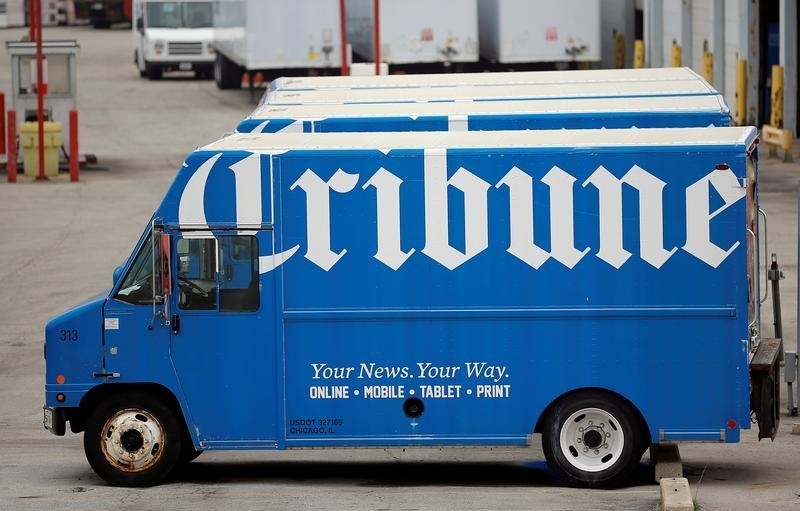 At least two-fifths of Tribune’s owners went along, according to a filing released Monday. Exclude the 17 percent stake held by Ferro and a few other insiders, and the number of withheld votes climbs just above a majority and even toward 60 percent for some board candidates, a Breakingviews analysis shows. That’s a remarkable rebuke given the outsized impact of proxy firm ISS. A joint paper from the University of Colorado, Columbia University and the University of Zurich about the adviser’s influence on uncontested director elections found that less than 1 percent of board elections resulted in more than 20 percent of owners withholding their votes unless ISS advised them to do so. Over a decade ago, after 43 percent of shareholders at Walt Disney didn’t cast a vote for then-Chairman Michael Eisner, the board stripped him of his title. A Chicago Tribune delivery truck in Chicago, Illinois, May 11, 2016. Over 40 pct of owners voted against all the publisher’s eight director candidates. That’s virtually unheard of when proxy advisers like ISS haven’t called for it. Maybe the board will be embarrassed enough to make tin-eared Chairman Michael Ferro listen to Gannett’s overtures.